As of April 2012 the world's largest airship will need a new partner. 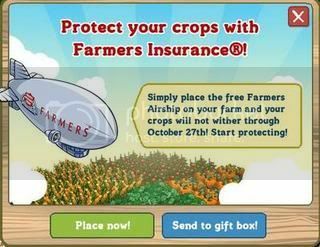 After two years flying as the Farmers Airship, Airship Ventures and its current partner, Farmers Insurance, announced today that the contract will be coming to an end this Spring. "The most successful airship sponsors are those who think big and we certainly accomplished big things with Farmers," said Airship Ventures Director of Sponsorship Joanne Fedeyko. "Our partnership proved that airship sponsorship can yield rewards beyond traditional marketing programs. We're excited to build on that success with a new partner who understands an investment in airship branding isn't just about having a cool billboard, rather using the airship as a platform for differentiating its brand and engaging its audience." Eureka not only visited sponsored golf, tennis and NCAA football events on behalf of Farmers, but also leveraged the partnerships at a broader scale using social media. When the Farmers Airship appeared in Zynga's online game FarmVille, users were given a real-life opportunity to experience a flight in the airship. Farmers ended up setting the world record for most "likes" in a 24-hour period on its Facebook page and over five million users downloaded the ad. Online, fans could submit a sighting, track the airship, submit videos and schedule a flight. "With the Farmers Airship, we've raised awareness of the Farmers brand, set records, and had a sky-high platform for charitable events in dozens of communities across the nation," said Farmers Insurance Vice President of Community Branding Chuck Browning. "Having the Farmers logo on the only U.S. Zeppelin made the Farmers brand literally, larger than life." For more info on the opportunity, get in touch with Airship Ventures Director of Sponsorship, Joanne Fedeyko.